Today Scott Guthrie announced a Learn Windows Azure event for developers running next week. Many people working with Microsoft Visual Studio and ASP.NET will be familiar with Scott’s work in these areas as well as ASP.NET MVC. From my experience, not so many developers are fully aware of what Windows Azure is and thats why it’s great that Scott, with his profile, is helping to raise an awareness of this powerful platform. Windows Azure has many features that are applicable to many types of applications. Take for example the compute facility. This enables developers to host applications in Microsoft’s data centres around the world on a pay per use basis. Many features such as scalability are provided out of the box. Windows SQL Azure provides a fully hosted relational database built on SQL server technologies. Windows Azure Storage provides different types of storage that todays applications require. For instance, the Azure Binary Large OBject (BLOB) service enables the storage of text or binary data to Azure. Why would you wish to do this you may ask ? Consider your Web applications static resources such as images and videos. Hosting these on your main servers will put unnecessary load on these servers when traffic increases – these resources do not change. Hosting them on Windows Azure’s BLOB storage service means they will be delivered efficiently without any load being placed on your core servers, which will be freed up to do more productive work. Having used Windows Azure for some time now, what is clear to me is that it is an outstanding Cloud Platform as a Service (PaaS) that has many features and facilities that can be used not only by applications written specifically for the cloud, but also existing applications to make them perform better and in a more cost effective manner. In addition Azure offers features such as Content Delivery Networks (CDN), caching, virtual networks, access control to mention a few. It is because there is such a rich feature set that I strongly believe are of benefit to a large number of .NET developers, that I so welcome somebody of Scott Guthrie’s stature raising awareness of Windows Azure. If you cannot make Scott’s event or would like a more detailed, hands-on coverage of Azure, why not consider attending Learning Tree’s Windows Azure course. Over the past few months, I’ve written a series of articles on learning Microsoft Windows Azure. I thought it might be helpful if I listed them all in one place. I’m also the author of Learning Tree course 2602, Windows azure Platform Introduction. If you want to move beyond the basics, come to this 4-day class. I’ll be teaching it in Reston, VA starting July 26. We also have it scheduled in Toronto, ON for Aug 30. If you can’t make it to either Reston or Toronto, you can also attend either of these live classes online from home or office via AnyWare. If you have any questions or suggestions for new Azure related articles, please leave a comment. Two of the largest providers of cloud computing services are Microsoft and Amazon. Both companies sell cloud services at every level of the cloud computing stack: Infrastructure as a Service (IaaS), Platform as a Service (PaaS) and Software as a Service (SaaS). In the world of cloud computing, Microsoft is probably best known for their PaaS offering, Windows Azure. However, they provide many other cloud-based services as well. These include SQL Azure for relational database, Office Live, SharePoint Online, Exchange Online, Microsoft CRM Online and SkyDrive. When Microsoft says they are “all in” on the cloud, they aren’t joking. Amazon’s best known cloud technology is their IaaS offering, Elastic Cloud Compute (EC2). They too have a full range of other services including, S3 and SimpleDB for storage, RDS for relational database and Elastic Beanstalk, their PaaS offering. Choosing between Azure and Amazon can be confusing, but a little knowledge will go a long way towards making an informed decision. At Learning Tree we have many cloud computing and related training courses that will help. To learn more about Windows Azure, come to Learning Tree course 2602, Windows® Azure™ Platform Introduction: Programming Cloud-Based Applications. If you’re in the Washington, DC area, I’ll be teaching that course on July 26, in Reston, VA.
Learning Tree is also developing a new course, Cloud Computing with Amazon Web Services. It is scheduled to run for the first time on August 30, also in Reston, VA. That course will be taught by the course author, Steve Lockwood. Learning Tree also has a great cloud computing overview course, Cloud Computing Technologies: A Comprehensive Hands-On Introduction. In that course we’ll give you an overview of the cloud services provided not only by Microsoft and Amazon, but also Google, SalesForce.com and others. Also, we just started a new .NET Programming blog. Please visit if you’re a .NET programmer, or would like to learn more. A Web application must be tested before deploying it to the Internet. To do this effectively, you need a test server. With Windows Azure, you can have an ASP.NET test server, on the Internet, for free. Go to this link to sign up for your free trial, http://www.microsoft.com/windowsazure/free-trial/. Admittedly, it’s not free forever. Once the free trial is over though, it will only cost you 5 cents per hour, for the time the server is running. So, if you want to put a site online for testing, it will cost you $1.20 per day or $6.00 for the work week. And there’s nothing else to buy. No hardware, no licenses, and no installation or administration. When you’re done, delete the deployment, and it costs nothing. When I teach ASP.Net, people often want to know details about deployment. With Azure, deployment is seamless and automated by Visual Studio. After a five minute setup, deploying to Windows Azure is three clicks. Right-click on your application in Visual Studio, select Publish, click OK. The details of deploying your application are handled by the Windows Azure operating system. When you deploy to Azure you can choose to deploy to either “Staging” or “Production”. If you are coming out with an update, first deploy to staging. From there you can make sure everything works. Then, you just flip the production and staging deployments. Later, if you realize you made a mistake, you can even flip them back. You just click the buttons in the Azure Management tool. Fault tolerance is achieved by creating redundant servers. If you deploy internally, that means multiple computers, wires, routers, load balancers, multiple copies of your deployments. All of that adds up to money and administration headaches. In Azure, if you want fault tolerance you specify an instance count greater than 1 in application properties. Scalability is achieved by increasing computing power. This can be done by adding more machines (scaling out) or adding bigger machines (scaling up). In Azure, this is done simply by setting instance count and VM size, again in application properties. When deploying internally, a company has to buy enough machines to handle their peak periods. In Azure, you can tune instance count and VM size up or down, paying only for the resources you need at any given time. I’ve written some articles on getting started with Windows Azure. Here are some links. At Learning Tree we have a 4-day class on Windows Azure, course 2602, Windows Azure Platform Introduction: Programming Cloud-Based Applications. We’ll cover everything you need to know. Take a look at the schedule and outline. Hopefully, we’ll see you there. 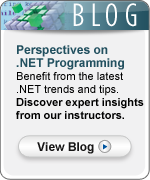 To read more about .NET programming, please visit Learning Tree’s .NET Programming Blog! Last week I taught the first European run of Learning Tree course 2602: Windows Azure Platform Introduction in Stockholm Sweden. There were some interesting things that came out of that course. All the students were experienced .NET programmers, but none of them were actually working on a project that used Windows Azure. Rather, they were all evaluating how Azure could be used for either their company or their customers. This is unusual in a programming class, but not surprising given how new cloud computing is. In talking to the students, they were very excited about the advantages of cloud-computing. I think the hard part is convincing the less technical folks in charge of the business. Understandably, the business is concerned with issues like security, cost, and interoperability. None of the students had any hands-on experience using Azure. None had even created an account to use it. Incidentally, Microsoft is offering a free trial, so go to this link if you’re interested, http://www.microsoft.com/windowsazure/free-trial. It’s a good way to get started and then come to class and we’ll make it easy. The biggest technical concern the students had was migration. This is understandable, as there are many questions that need to be addressed. How much does it cost? How do you deploy an application to the cloud? What changes are needed for an application to use Azure? What unique security concerns are there with Azure? How does the application access the database? How do you move an existing database to SQL Azure? These types of questions are what we try to answer in the class. One student was particularly interested in using cloud computing for parallel processing for a long running task their company had. We have a chapter in the course devoted to this topic, where we cover using worker roles and queues for asynchronous processing. This is one area where cloud-computing in general and Azure specifically excels. Most importantly, I had dinner in the best Indian restaurant I’ve ever been to. The name of the restaurant is Dado. It’s fantastic! If you’re ever in Stockholm it’s a must. Next week I’m teaching the course again in New York City. There I’ll have the best steak in New York at Ancora. Maybe I’ll see you there. I was talking to a colleague last week and he asked, “If you deploy an application to Azure, can you move it to a different cloud provider later on?” To answer this question, let’s look at three things. First, what is Azure really? Second, does writing an Azure application lock you into Azure? And third, is there a need for standards in cloud-computing? Let’s say you write a Web application using ASP.NET. That application will run on any Windows server. Azure is really just a virtual machine running an instance of Windows server. So, moving an application from an Azure virtual machine to an Amazon EC2 virtual machine is no different than moving an application from a Dell server to an HP server. In fact, it would be quicker, because you wouldn’t have to buy the hardware or install the software. That is not to say there are no issues, but it’s really not that big a deal. You might want to check out this article for a Look Inside a Windows Azure Instance. There are changes you’d likely make in your Web application to take optimal advantage of Azure’s architecture. For example, you would likely use Azure Storage for sessions, membership and online data. Check out the following article to find out why, Windows Azure Training Series – Understanding Azure Storage. Surely, that would lock you into Azure. Well not really. Azure Storage can be accessed from anywhere via http. So, while you might be using Azure Storage from an Azure application, you could just as easily use it from an application running on EC2, Google App Engine or from your local area network. So, if you had an application using Azure specific features and wanted to move it, it would not mean a rewrite. Whenever people start talking about a need for standards I get worried. Standards mean committees and meetings and great long documents. I would argue we already have the standards we need. All of Windows Azure is made available using http and a REST-based API. That means any platform that can make an http request, can use Windows Azure. The same can be said of Amazon Web Services and Google App Engine. Microsoft provides Windows Azure for compute services, SQL Azure for relational database and Azure Storage for data services. Amazon has EC2, Elastic Beanstalk, S3 and RDS which collectively provide the same services. Google offers App Engine and Big Table. You can mix and match the services from these providers any way you think is best, and move between them over time. So, yes you can deploy an Azure application today and move it elsewhere later. To learn more about Windows Azure, check out Learning Tree course 2602, Windows Azure Platform Introduction: Programming Cloud-Based Applications. Or, to learn more about cloud-computing in general, come to Learning Trees Cloud Computing course. A Windows Azure instance may seem like a mysterious black box, but it is really just Windows Server running in a virtual machine. Using remote desktop, I accessed an instance that I had previously deployed. Kevin Kell wrote a good article on accessing Azure Instances using RDP, if you are interested. The instance I accessed was a “Small Instance”, which according to Microsoft, has a 1.67Gh CPU, 1.75 GB of memory and 225 GB of storage. This computer would cost about $80 per month. Let’s hunt around a bit. A look at Computer properties shows I have Windows Server 2008 Enterprise edition with service pack 2. I can also verify that I have 1.75 GB of RAM and one CPU. A look at Windows Explorer shows I have three drives, and sure enough 225 GB of instance storage. The instance I deployed was a Web role. That’s just a fancy way of saying IIS is running and the ASP.NET application that I deployed is set up. See the screen shot below. A look at my Web application’s Advanced Settings shows the application I deployed was uploaded into the computer’s E drive. I was also curious about what versions of the .NET Framework were installed. It turns out they all are. If you are already a Windows administrator or .NET developer you can take advantage of cloud computing and Azure’s benefits, while leveraging your existing knowledge. Those benefits include, reduced administration, simplified deployment, massive scalability and fault tolerance. If you’d like to learn more about Azure, come to Learning Tree’s Windows Azure training course. If you want to use Windows Azure, but don’t know .NET programming, come to Learning Tree’s Introduction to .NET training course.